Hope everyone is well, this is my first post in June '11 so i thought i'd start it off with a review and giveaway in one post! I was fortunate enough to be apart of the ever growing Affiliate program with Sigma Makeup and got the chance to have been sent the F80 for review purposes a couple weeks ago. After being using it for quite some time, i said it was time to review this brush based on my opinion. This Brush Came Packaged in a box with a sigma logo sticker. Opening the box the brush was in a cute red organza bag. and also welcoming me to the affiliate program. 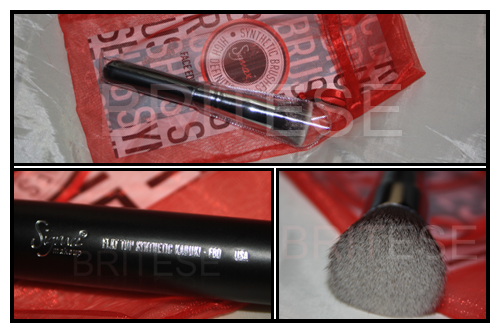 It has very Soft bristles which makes blending so easy. I just dab some foundation on my hand and stipple the F80 into the product and first stipple it in areas then blend in circular movements covering small areas at a time. Being as its synthetic fibers this can be used for any liquid products, such as foundations or cream blushes. Ends in 3 weeks time. I love Sigma. I really want to try the new dry n shape system and also the angled kabuki F84 as I've heard its really good for cream blushes, which I love!